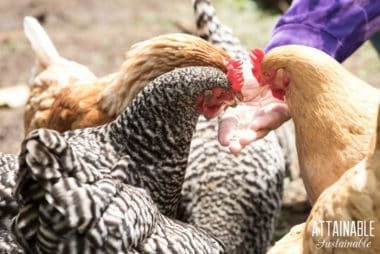 Chickens are the perfect farm animal for those in the suburbs! 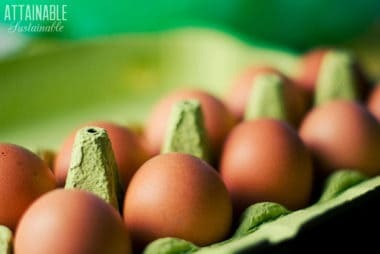 They’re easy, don’t take up much room, and they turn kitchen scraps into eggs. Pure magic. “They” say that raising backyard chickens is just the start. That chickens are just a gateway animal. They might be right. Chickens are incredibly easy to raise, and they don’t take up much space, making them perfect for hobby farmers who live in the suburbs. 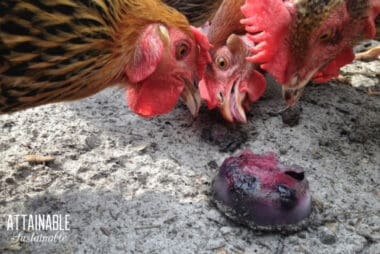 Hens provide eggs, as well as a bit of comic relief with their funny antics. Raising backyard chickens requires some basic infrastructure. A coop to protect them from predators and provide a safe, dry place to sleep is a must. A fenced area in which to range further afield is optional, but allows the chickens to forage for some of their own food. 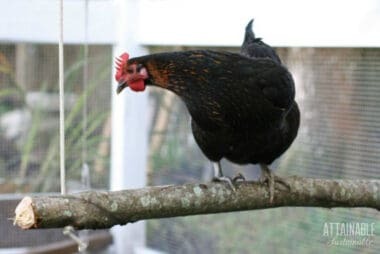 Nesting boxes provide a place for hens to lay eggs, but don’t be surprised if they opt to lay eggs under a private bush. 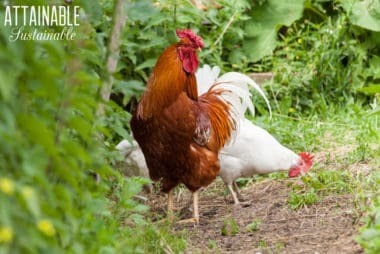 One of the greatest things about raising backyard chickens is that they don’t require a lot of special care. Provide them a safe space and plenty of food and they’ll happily provide you with eggs, no questions asked! 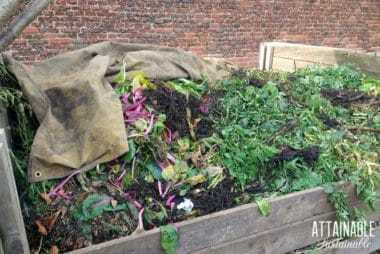 Learning how to compost kitchen scraps and yard waste results in FREE garden amendments! 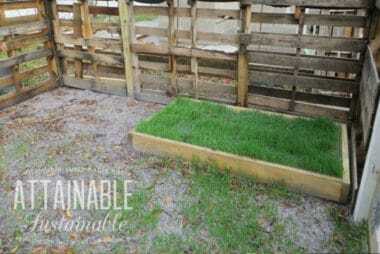 Your garden will thrive with homemade compost generated on site. 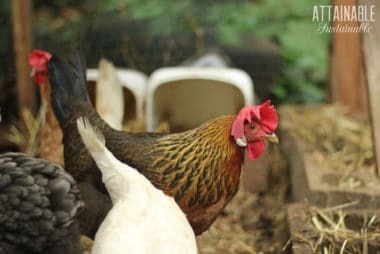 Try implementing some of these easy tricks to keep chickens cool & make the heat more bearable for your hens. Summer heat doesn’t have to = miserable hens. 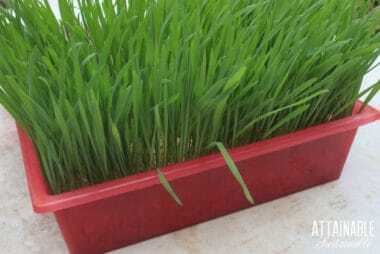 DIY grazing boxes make for happy grass fed chickens. 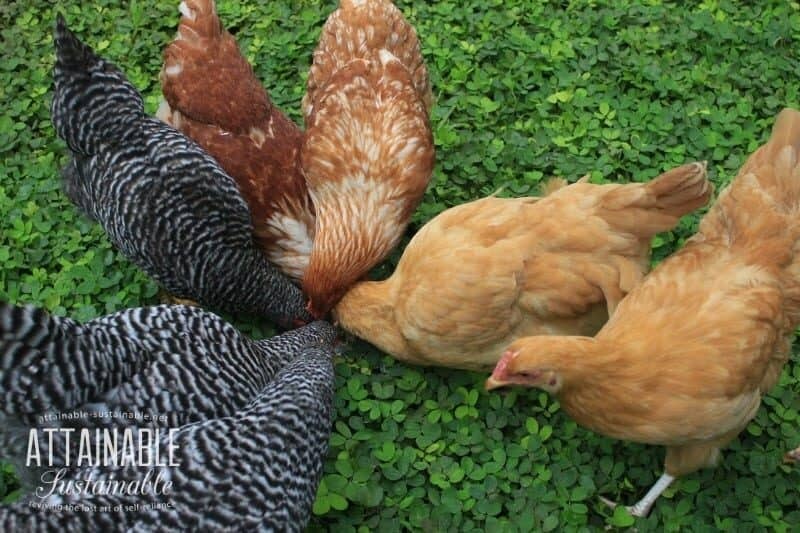 They’re a great way to save on the cost of raising backyard chickens (and other poultry), too! Processing chickens — otherwise known as butchering chickens — at home means putting healthier birds on the dinner table. Here are tips to make it easier. Inside this coop? Six hens who would really prefer to be on the other side of the door. The outside of the door.